Once the permit(s) is issued, we will be on-site within the next week to lay-out the pool. The following day we will excavate the pool and begin to form it and put in steel reinforcing rods on the bottom and sides of the pool, into the bond beam, and around the skimmers. These rods are firmly wired together to add to the strength and longevity of your pool. We then will call for our first inspection. We are now ready to “shoot the pool”, meaning a concrete mixture is pneumatically applied under great pressure to bond tightly around the steel reinforcing rods. The result is a steel reinforced concrete shell of superior strength. If we are building waterfalls or rock walls, the pool sides may be up to 4′ thick where the rock will be placed! All of our regular pool walls are 8″ thick rather than the industry standard 6″. We then let the concrete cure for a minimum of 28 days to meet the warranty requirements of the interior pool finish. The next day we pull off the forms and apply a special sealing material to any areas that will be under the rock work. It is a special crystalline sealer used to seal tunnels, bridges, and airport runways. We are the only pool company that uses it. This guarantees that there will be no water loss underneath the rock waterfalls and stone work. Three days after the pool is shot, we can begin the stone work, tile and coping, plumbing and electrical. Depending on the scope of the rock work, this part of the job can take anywhere from one to three weeks. Once the plumbing is in, and before it is hooked up to the pumps, we call for a final plumbing inspection. Our plumber will install state-of-the-art salt water or ozone pool equipment to filter, purify and heat your water. A licensed electrician, specializing in pools, will complete the work by connecting the pool equipment. If an upgrade to the electric is needed to power the equipment, or more power needs to be brought from the main panel to the pool pad, this electrician is qualified to do it. Once the equipment is hooked up and ready to go, we call for the electrical inspection. After the rock work, tile, coping, main plumbing and electrical lines are installed, the concrete deck (if needed) is formed, drains are installed and the soil treated by a professional pest control company, where applicable. We call for an inspection and, after it has passed, we pour the concrete. If you have chosen travertine, flagstone or similar pavers, the installation will then begin and can add up to 10 days to complete. This is dependent upon the size of the deck and whether it is to be sand-set or mud-set. As soon as the 28 days have passed, interior finish crew arrives. Application takes half to one day, depending on the size of the pool. Do not worry if the color that they are applying does not look like the sample you chose. What you are seeing is the grout that covers the pebbles and not the pebbles themselves. The next day, a specialized member of the crew comes back to spray down the pool and wash off the grout that is covering the small pebbles that make up the interior finish. As soon as he finishes washing down the pool, we will begin filling it up. This usually takes 24 to 72 hours, depending on the size of the pool and the water pressure. If you are using public water we will give you a letter so that you are not charged at the highest rate for water usage. The usual pool usually costs between $75 and $175 to fill. 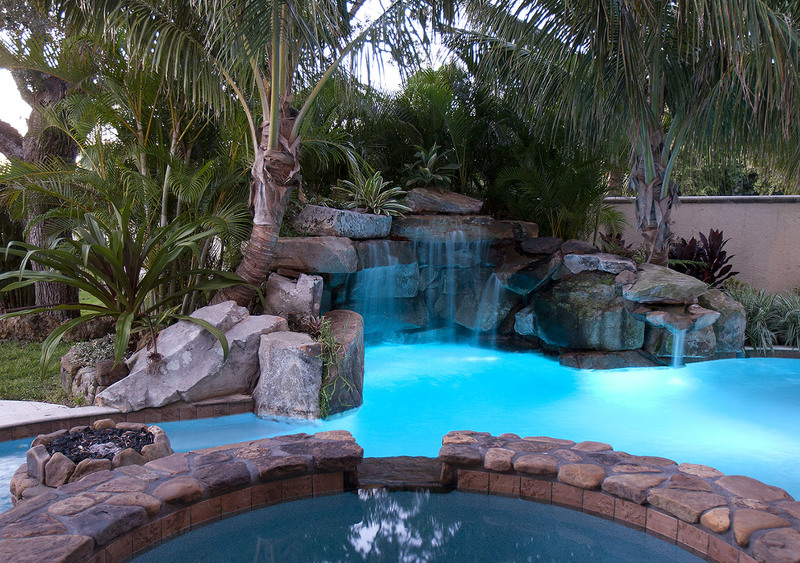 After the pool is filled and the pool and waterfalls are running, the project is considered to be substantially complete and the final payment is due. The next step is to balance out the pool chemistry. This takes from three to seven days and, yes, you can swim in your pool after the first 24 hours. It won’t be as perfect as it will be eventually, but it won’t be dangerous or unhealthy. Once the pool chemistry is balanced out, we will give you an instruction sheet telling you how to maintain your own pool, and we will show you how to test the chemistry, clean the filter, and fill the chlorinator. If you decide that you would rather have someone else maintain it, we will give you our recommendations. In order to call for our final inspection, pool fences and/or alarms must be installed. We will install alarms for you at no additional charge, however, the fencing is your responsibility. We will, of course, help in any way we can. We call for a final inspection and the inspector checks the alarms and/or fences and signs off for the last time. The last thing that we will do is add any irrigation that is needed for the new planting and re-sod any areas we have destroyed with our heavy equipment. We will do a final walk through with you and fix anything that you think needs fixing. When we leave the job we want everyone to be completely satisfied that the job was done both beautifully and professionally. We warranty our work for two (2) years!! We are that confident! Plus we use only top-of-the-line pool equipment which generally comes with a three (3) warranty backed by the manufacturer’s certified technicians. It has been our experience that, in the rare event this equipment has a problem, the technician’s address the situation immediately. One of the most frustrating factors in construction is weather delays. We can’t control them, but we do our best to work through inclement weather if it is safe to do so and will provide the same high quality outcome we expect. We will be on the job every day possible! When everything is finished, we will wait for our invitation to the party we know you are going to have to show off your beautiful new pool and unique outdoor paradise! No matter the size of your project or where we are constructing it, a Custom Lucas Lagoons pool will take less time to build with a whole lot more detail than the average pool company… but, then again, we’re not average!